The nickname for Ohio and its inhabitants--Buckeye, (Hippocastanaceae Aesculus glabra,) became official in 1953 when the legislature named the Ohio Buckeye the state tree of Ohio. The buckeye tree derives the name from its large brown seeds, which resemble the eyes of the white-tailed deer. 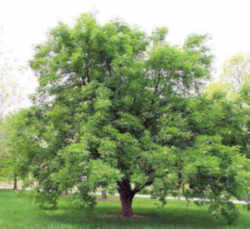 People commonly confuse the Ohio Buckeye tree with the Horse Chestnut, (Aesculus hippocastanum.) 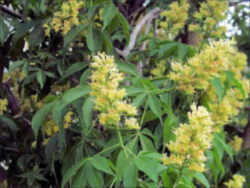 In addition, the Yellow Buckeye, (Aesculus octandra,) also grows in Ohio. 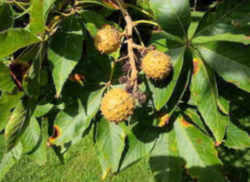 It is closely related to the Ohio Buckeye, and it is difficult to differentiate between the two species. 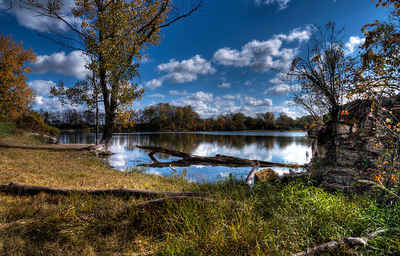 The tree species Aesculus glabra is commonly known as Ohio buckeye, American buckeye, or fetid buckeye. Glabra is one of 13-19 species of Aesculus also called "horse chestnuts"
Ohio buckeye also known as American buckeye, fetid buckeye, and stinking buck-eye, derives its unflattering common names from the disagreeable odor that emanates when the leaves are crushed. 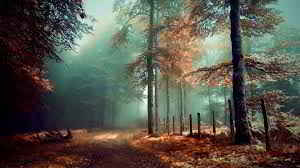 The tree is an attractive ornamental, but it has limited commercial use as saw timber because of the soft, light wood. The bark and seeds contain a narcotic glucoside considered poisonous to livestock, leading many landowners to eradicate it. Leaf: Opposite, palmately compound with 5 leaflets. Oval to obovate leaflets are 3 to 6 inches long with a serrated margin, rachis about as long as leaflets. Dark green above and paler below. Strong fetid odor when crushed. Flower: Light yellow, in large, 4 to 7 inch, showy, upright clusters. Stamens are longer than petals. Appear in April to May. Fruit: Prickly, leathery husk enclosing usually 1 smooth chestnut brown seed (1 to 1 1/2 inches in diameter). Borne on a stout stalk and mature in October. The Buckeye Nut comes from the Indian word "hetuck" which means eye-of-a-buck. In addition to increasing the bearer's sexual power, the buckeye is thought by many people in the eastern and southern United States to be a sure preventive of rheumatism, arthritis, or headache. Identical beliefs were recorded in Germany and the Netherlands during the early 19th century, but there the preventive power was attributed to the buckeye's European relative, the horse-chestnut. It is probable that European immigrants transferred the horse-chestnut's magical ability to the buckeye when they settled in America. This beautiful nut is the fruit of the Buckeye tree. Twig: Stout, with a large shield shaped leaf scar. Fetid odor when broken. Terminal buds are large, orangish brown with keeled scales. Opposite lateral buds are much smaller. Bark: Initially smooth, ashy gray but later developing corky, scaly patches, becoming quite rough and darker gray. 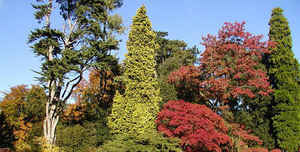 Form: Upright, medium sized tree, 60 to 80 feet tall, 2 feet in diameter. Oblong crown with pendulous up turning branches. The law designating the Buckeye as the official Ohio state tree is found in the Ohio Revised Code, General Provisions, Chapter 5, Section 5.05.